An unlikely looking hitter due to his "foot in the bucket" batting stance, Simmons was a leading slugger of his era. 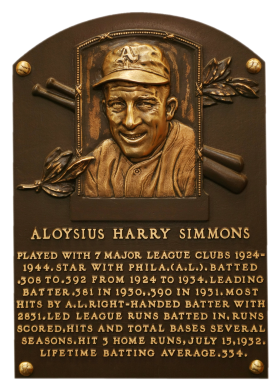 From 1929 to 1931, he helped the Athletics to three consecutive pennants, winning batting titles in both 1930 and 1931 with averages of .381 and .390. "Bucketfoot Al" batted over .300 in the first 11 seasons of his career, racking up 2,927 hits and a career .334 batting average. 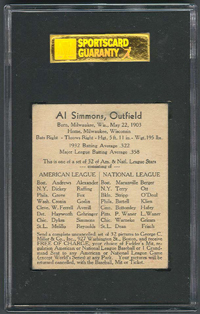 Comments: The first Simmons portrait I picked up was a tribute card - a 1960 Fleer graded PSA 9 off eBay in Sept, 2000. In January, 2003 I replaced it with a 1936 R314 issue after buying a PSA 4 copy in November, 2003 via eBay. It's a great image showing the player with a huge grin. In the subsequent months I purchased a couple more raw copies in hopes of upgrading but neither was nice enough once received in hand. I upgraded to a PSA 5 with another eBay purchase in October, 2003. 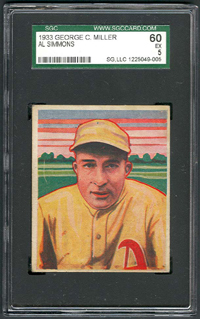 One of the raw examples graded out EX-MT by PSA. A few years later, I decided to swap out the R314 with a different type card. I already had a Lindstrom representing the set and he didn't have any other portrait cards that I liked. I wanted to maximize type cards in the collection and I didn't have a George C. Miller card. 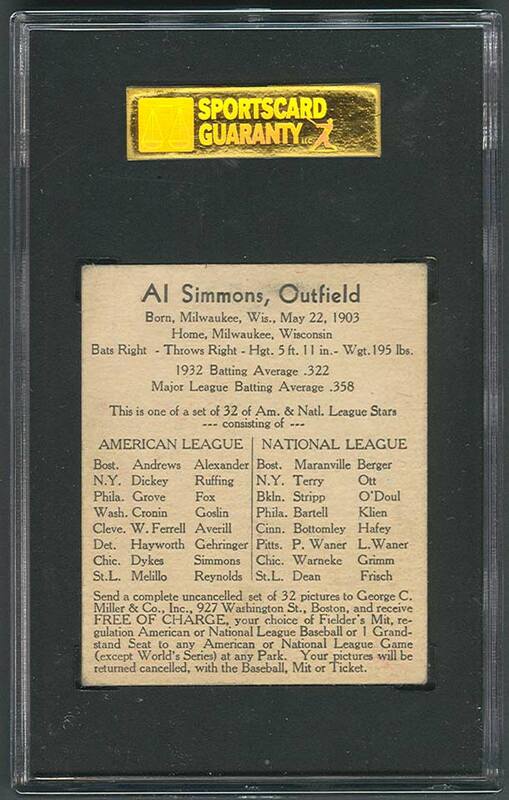 So, I started looking for a R300 Simmons and found a PSA Authentic copy in an eBay auction in Sept, 2006. A couple months later, January, 2007 I upgraded the "altered" card with this SGC 60 example in a private sale. I've been looking for a nicer example since and have had no luck - tough card. 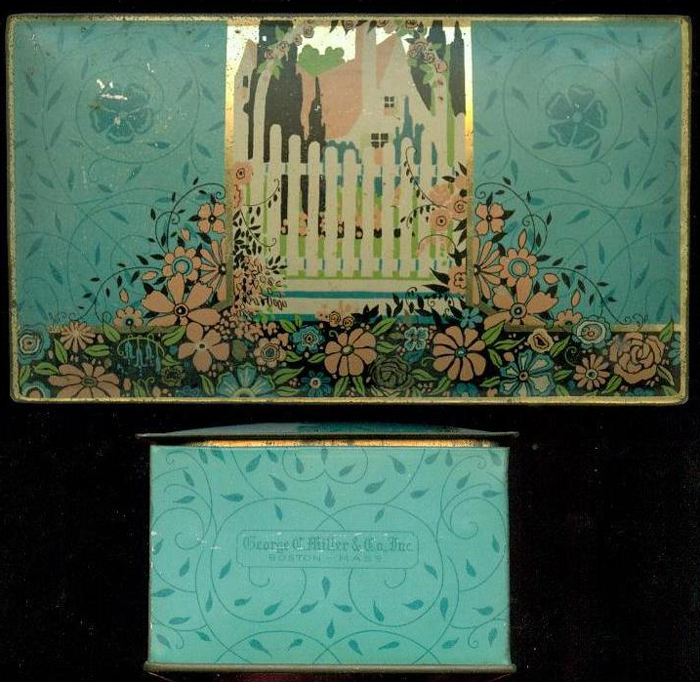 Description: George C. Miller & Co. of Boston, Mass., issued a 32-card set in 1933. The set, which received limited distribution, consists of 16 National League and 16 American League players. The cards are color art reproductions of actual photographs and measure 2-3/8" X 2-7/8". Two distinct variations can be found for each card in the set. Two differerent typefaces were used, one being much smaller than the other. The most substantial difference is "R" and "L" being used for the "Bats/Throws" information on one version, while the other spells out "Right" and "Left". Collectors were advised on the card backs to collect all 32 cards and return them for prizes. (Ivy Andrews' card was short-printed to avoid giving out too many prizes.) The cancelled cards were returned to the collector with the prize. Two forms of cancellation were used; one involved the complete trimming of the bottom one-quarter of the card, the other a diamond-shaped series of punch holes.